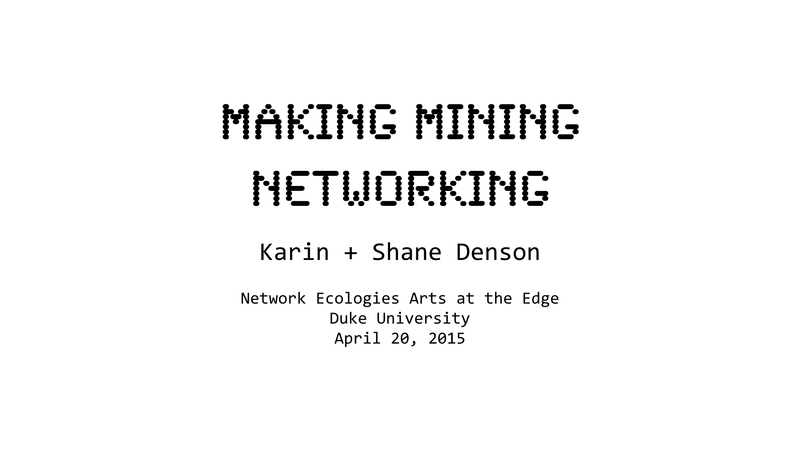 Making Mining Networking, a collection of works by Karin Denson and myself, opened yesterday at Duke University’s digital research, collaboration, and exhibition space The Edge, as part of the Network Ecologies project organized by Amanda Starling Gould. Also on display are fascinating works by Rebecca Norton. The show will run until Fall, so check it out if you get a chance. 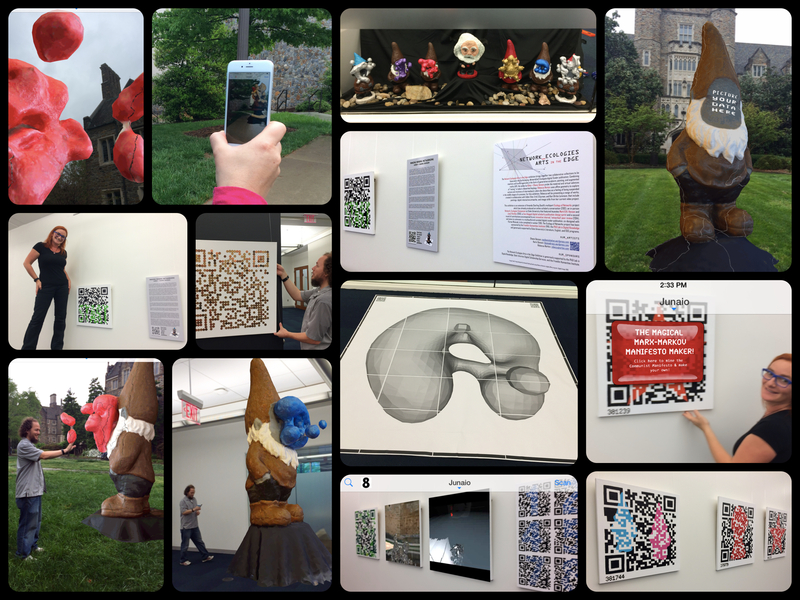 Be sure to bring along your smartphone or tablet with a QR scanner installed, as all of our pieces are scannable, interactive works that will open an augmented reality browser. First of all, if building and dwelling were the quintessential human activities for Heidegger, our title suggests the possibility of some developments that couldn’t have been anticipated by him and that have to do with the advent of digital media, among other things. “Building,” which for Heidegger opened up spaces and gathered “worlds” for communities that came into being around the Greek temple or the bridge across a romantic German river, gives way today to more local, far less grand practices of “making”; the maker culture that centers around 3D printing, physical computing, and other technologies might be emblematic of this shift. And “dwelling,” which for Heidegger described the supposedly authentic mode of existence of mortals upon the earth, becomes infinitely minable today, as mining comes to name physical and virtual processes that transform the mere fact of living into the source of a surplus value that can be accumulated, processed, and exploited. And finally “thinking,” which for Heidegger implied a profound sort of “questioning,” aimed at getting to “the ground” of Being in all its Romantic mystery, has perhaps given way to a more superficial, also not unproblematic, mode of relating things: the pervasive mode of “networking,” which connects people and things in both systematic and haphazard ways. Finally, though, the reference to Heidegger is also meant to signal our commitment to interrogating these developments in terms that might indeed resonate, if only awkwardly, with Heidegger’s mode of questioning – in terms, that is, of the impacts that making, mining, and networking, as characteristic activities of our contemporary moment, have on our lifeworlds and on the reorganization of spatial realities through the addition of virtual and augmented layers. Above, Patricia Pisters’s talk “The Filmmaker as Metallurgist” — the third of five videos documenting the “Post-Cinema and/as Speculative Media Theory” panel I chaired on March 27, 2015 at the Society for Cinema and Media Studies annual conference in Montreal. Up next: Adrian Ivakhiv. Stay tuned! This piece collects a variety of images circulating online and thinks about the status of what Hito Steyerl calls “the poor image.” Of particular interest is the conjunction of technological, political, socio-economic, and aesthetic facets, factors, and practices that Steyerl identifies in her provocative essay on the subject. 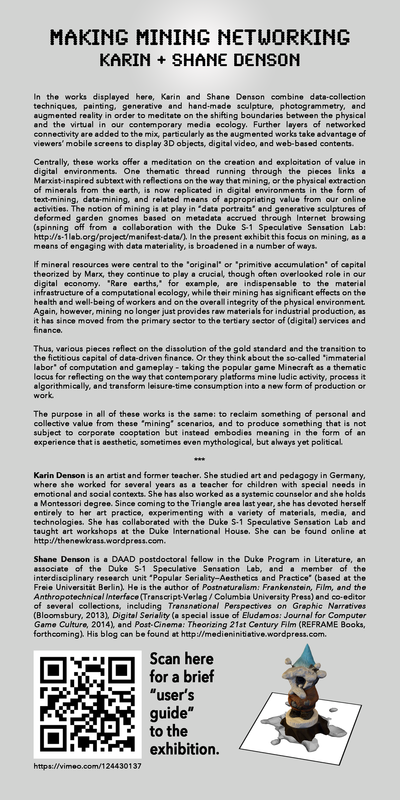 Significantly, Steyerl breaks with both nostalgic or backwards-looking approaches to the “end” or “death” of cinema and with the one-sided celebration of a so-called “participatory culture,” which tends to ignore the capitalist framework within which fan-based acts of appropriation and expansion are themselves appropriated as “immaterial labor” in the service of big-business entertainment franchises. This project seeks to highlight the ambivalent status of the poor image, utilizing techniques of datamoshing and databending, themselves fan-based techniques for image impoverishment that have also been employed in high-profile projects (e.g. big-budget music videos) and projects with a high-cultural cachet (e.g. gallery art). In order to question the confluence of technical and socio-economic/political considerations at work in the poor image while avoiding too much editorial interference or interpretation on my part, the video above works generatively – drawing materials from YouTube and collating them according to the itinerary dictated by the search results for the term “poor image.” That is, the first 44 search results (from a query conducted on April 8, 2015) are cycled three times, in the order of their appearance in the list of results – initially taking the first ten seconds of each clip, then the next five, and finally the next second. After combining the images, in this order, all I-frames were removed (so-called “datamoshing”), thus establishing unexpected – and, I think, interesting and sometimes telling – connections between the clips. 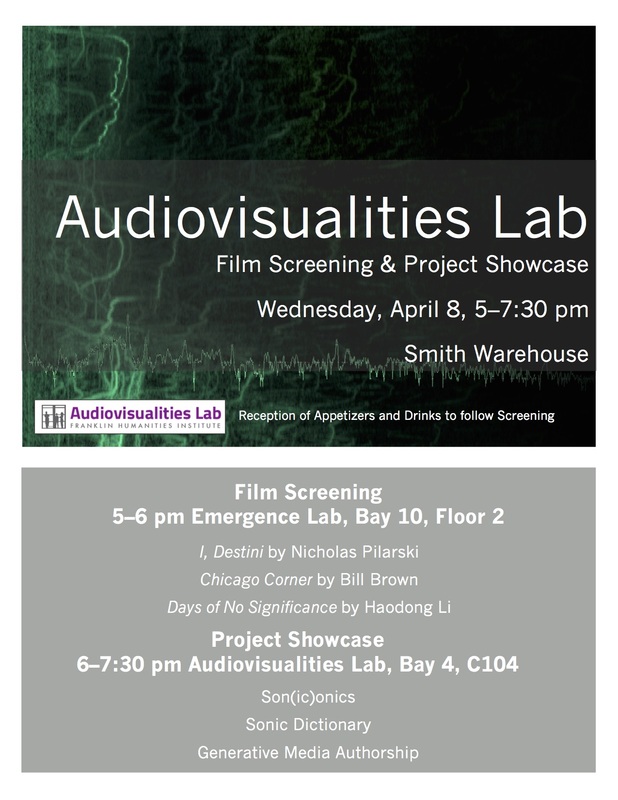 On April 8, 2015, I will be participating in this event, hosted by the Duke Audiovisualities Lab. 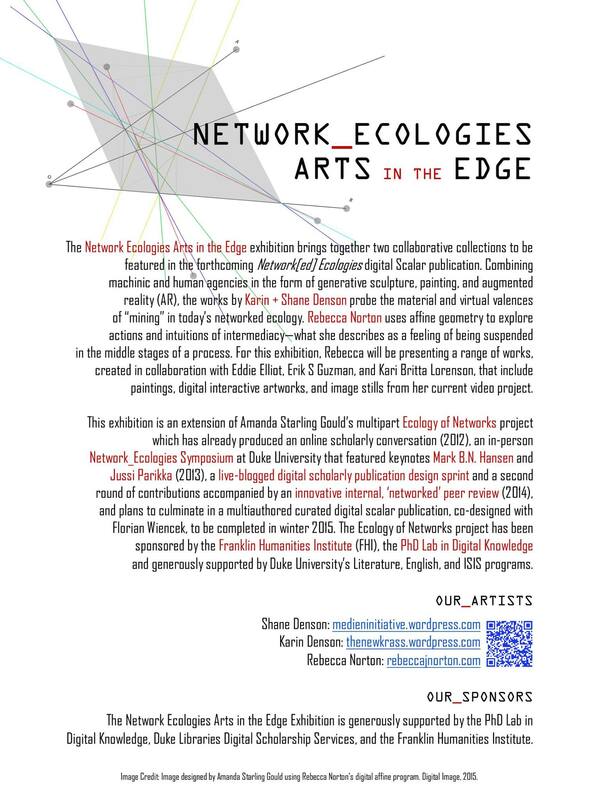 During the “project showcase” portion of the event, several of the people involved in Bill Seaman and John Supko‘s Generative Media Authorship seminar — including Eren Gumrukcuoglu, Aaron Kutnick, and myself — will be presenting generative works. I will be showing some of the databending/glitch-video work I’ve been doing lately (see, for example, here and here). Refreshments and drinks will be served!